In 1958 Mark Rothko, renowned Abstract Expressionist, was commissioned to paint murals to hang in the Four Seasons restaurant that was to be in the heart of the Seagram’s Building designed by Mies van der Rohe and Philip Johnson—the first great Modernist building in New York City. The commission was the largest any American artist at that time had received. 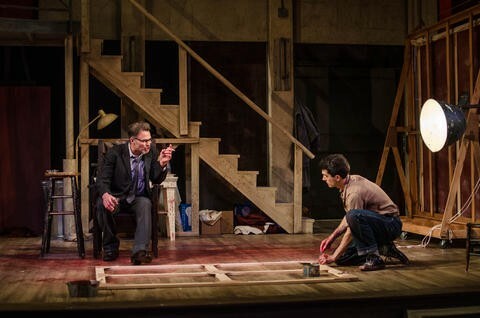 The play, Red, by John Logan, which will run through July 6 at the Dorset Theatre Festival, takes place in Rothko’s studio during the two years that he and one assistant worked on that commission. It’s what the British call a two-hander, a play with two actors. It is an exploration of the value and meaning of art, a commentary on the cyclical nature of life and art, a reminder of the inexorable passage of time, and, most of all, a window on the development of a relationship between a passionate and exacting mentor and his young acolyte, the relationship between the past and the future. Ken, the assistant (played effectively by Charles Socarides) begins his apprenticeship cowed in the presence of this artistic giant who demands a sensitive “human” reaction to his work and then belittles the young man’s timid response. 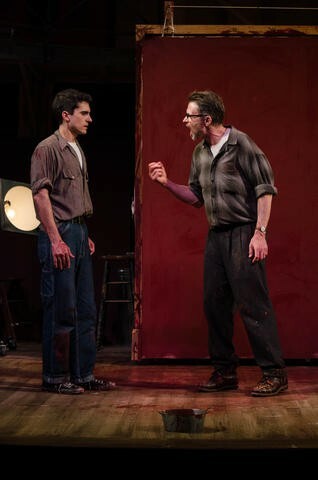 As the play progresses the tyrannical and sometimes bullying Rothko, (played with commitment and energy by Tim Daly) speaks passionately of his work, of art, and of artists. 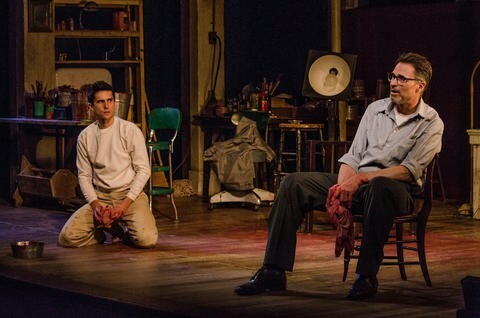 Rothko boasts that he and his generation of artists “destroyed Cubism…We stomped it to death.” He declares that “The child must banish the father, respect him, but kill him,” a declaration that is at the crux of this engrossing play and that will be reflected back to him as Ken grows, learns, and gains confidence. Throughout the play the actual “work” of art is presented onstage, which gives the production a surprising energy. It is not the dainty creation of “pretty pictures,” but the physical exertion of stretching canvas, building frames, mixing paint, and rapidly priming and painting large canvases. And so the child becomes the man; the student, the teacher. The Dorset’s production, directed by Adrienne Campbell-Holt is solid, its pace making the 90 minutes fly by. Though the Dorset’s stage is small, the set with a second level evokes a large working studio, heavy and dark as befits the workspace of an uncompromising artist who defined painting as an expression of tragedy. Though this production is thoroughly absorbing, the lack of any visible cues such as change of scenery, failed to adequately signal the passage of time, so that Ken’s comment about having worked together for two years was a surprise. I would also have liked to have seen a more gradual growth in the character of Ken, though Socarides’ Ken evinces confidence and power by the end of the production. Red at the Dorset Theatre Festival is a thoughtful, engaging, memorable theater experience. It would be a shame to miss it.